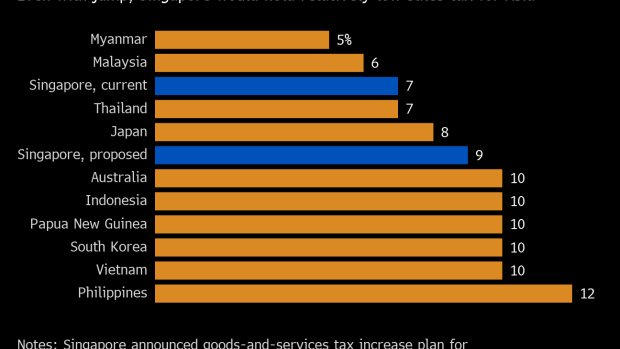 (Bloomberg) -- Singapore Finance Minister Heng Swee Keat will aim to strike a delicate balance in Monday’s budget: preaching fiscal prudence while doling out more social spending ahead of elections that could come as early as this year. While not expected to be as headline-grabbing as last year -- when Heng flagged a hike in the goods-and-services tax -- the 2019 budget will cover a range of familiar policy priorities. Infrastructure spending, more health-care support for a rapidly aging population, and help for firms transitioning in a digital economy were top-of-mind for Heng in a Jan. 22 interview. The global backdrop calls for more caution. Weaker demand and U.S.-China trade tensions saw Singapore’s export-reliant economy grow at a slower pace than expected in the fourth quarter, data showed Friday. “Expectations for a spending spree are high on past surpluses, likely elections and downside economic risks,” Mohamed Faiz Nagutha, an economist at Bank of America Merrill Lynch in Singapore, said before the data was released. Those expectations should be reined in since the economy “is not in a crisis,” he said. The budget deficit could be smaller than projected thanks to improved tax collection. Nagutha sees a shortfall of 0.6 percent of gross domestic product in the primary balance, versus the government’s 1.6 percent estimate. “Merdeka” will be the word of the day. That refers to a big portion of the population that came of age during Singapore’s independence era in the 1960s, and which the government plans to support through insurance subsidies, top-ups for medical savings programs, long-term care funding and other goodies. Having already rolled out similar assistance for the elder Pioneer Generation in fiscal 2014, the larger Merdeka Generation of almost a half-million citizens could benefit from about S$8 billion ($5.9 billion) in fresh spending, according to an estimate by economists at Maybank Kim Eng Research Pte. in Singapore. The support is in line with the government’s messaging on ensuring the city state thrives even as its population ages at one of the fastest rates in Asia. Heng and other officials have reiterated that they’re “not done building Singapore.” Last year’s infrastructure component of the budget was quite broad, including the formation of a new government agency dedicated to acting as a broker for the region’s much-needed development projects. This year, we’re likely to see more housing than road-and-rail: Lee has already flagged more spending to revamp public housing, and the budget might build on those schemes. Since the introduction of housing curbs in mid-2018 to damp price increases, some homeowners have found it difficult to sell their properties. Look for some form of resale support, Citigroup Inc. said Feb. 7. National security could make up a growing slice of the spending pie. While maritime skirmishes with neighboring Malaysia have grabbed attention since the start of this year, Singapore officials may also boost defense spending because of the rising threat of cybersecurity breaches and terrorism. Defense spending is also overdue for an increase, having grown at less than half the pace of social or economic development, according to Barnabas Gan, an economist at United Overseas Bank Ltd. in Singapore. There may also be further confirmation of a purchase of some F-35 fighter jets made by U.S. defense giant Lockheed Martin Corp., the Maybank analysts suggest. Heng said last month that the budget will reserve some focus on helping small businesses adapt to a digital economy, so look for research-and-development incentives or other credits to help boost those firms. The government could offer some support for firms looking to expand overseas, such as a fast track for grant approval in high-growth industries or more support for trade associations abroad, said Irvin Seah, an economist at DBS Group Holdings Ltd. in Singapore. Having already announced an increase in the goods-and-services tax to 9 percent from 7 percent sometime in the 2021-2025 period, there may be more detail on the plan in this year’s budget. Also possible is further guidance on how Singapore plans to tax digital purchases, given last year’s announcement that a GST on imported services would take effect at the start of 2020. And don’t count out the possibility of a sugar tax amid the government’s long-time diabetes-awareness campaign.